At Eos Rejuvenation, we are committed to staying abreast of the newest and most innovative treatments available for rejuvenating your skin! Traditional laser procedures for skin resurfacing have been falling out of favor of late due to their high cost and longer downtimes, which can be anywhere from 5 to 14 days. And, even after the initial healing period has passed, Beverly Hills patients often continue to sport facial redness, a telltale sign of having had a laser treatment. Now there is a new and exciting alternative skin resurfacing and skin care treatments. If you want a refreshed look that an ordinary facial cannot provide but want to avoid the cost and downtime of a laser procedure, we highly recommend Micro Needling: the art of lightly piercing the skin with multiple, tiny holes, using a specialized medical device, which stimulates collagen and Elastin molecules to create new skin. For an overall rejuvenation of your skin that is easier on the pocket book and will not require you to “hide” at home for days, Micro Needling is a breakthrough procedure that we are excited to offer at Eos Rejuvenation. At your consultation in Beverly Hills, Dr. Nima will go over your issues with you, determine if you are a good candidate for Micro Needling and help set reasonable expectations for your results. To perform Micro Needling, we apply a topical numbing cream on your face approximately 30 minutes before the procedure to insure your comfort. The skin is then cleansed with an antibiotic soap after the numbing cream has taken effect, and three “passes” over the treatment area are performed for one treatment. Mild redness typically lasts for about 24 hours. Results from the micro needling can be apparent as soon as the next day, with only a minor amount of swelling; however the best results are achieved over time and with multiple treatments, with some issues requiring more treatments than others. For example, acne scars can be relatively shallow or relatively deep. It is no surprise that the deeper the scar, the more treatments may be required to improve it. We will send you home with a skin care treatment “package” for you to use for 5-7 days following the procedure. Because of the nature of the procedure, you will need be cautious for the first week following the treatment regarding use of other skin care products which are not meant to be used on “punctured” skin and can cause itchiness and redness. We recommend a series of 3 to 6 treatments, with at least a month in between, for the best overall results. 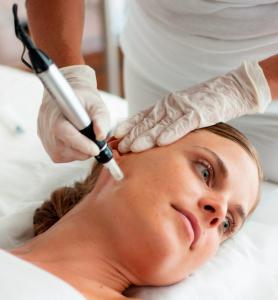 Contact your office in Beverly Hills to schedule a micro needling consultation at (310) 772-2866.